Today, we return to my home state of Queensland to talk about a place that has some family history. This story is a about Rainbow Bay and the story has been contributed from my Mum – Kay Benson. In sections of this post I have quoted her directly – the rest is a combination of her words and my little edits. Is its name suggests, Rainbow Bay is a beautiful little bay situated between Greenmount and Point Danger on the furthest point south on the coast of Queensland. It is within a stone’s throw of the New South Wales and Queensland border. My Mum and her extended family holidayed there for many decades, either camping at the camping grounds that used to exist on the foreshore, staying in a holiday flat, or at St George’s Holiday Home overlooking the Bay. During the fifties and before the introduction of shark nets it was common to see grey nurse sharks swimming close to the shore. The lifesavers were vigilant in watching for these sharks and once the shark bell was rung we knew it was time to get out of the water quickly. St. George’s Holiday Home was specially set up by the Anglican Help Society in 1915 as a respite and recuperation centre for the soldiers returning from overseas active service. Today it remains a Holiday Home for ex-servicemen and women. Over the past 70 years, four generations of our family have holidayed at Rainbow Bay – including my great grandparents, grandparents and parents – who all love that area. In December 1978, our family came down from Darwin and we stayed around the corner from Rainbow Bay at 77 Sunset Strip Coolangatta, which I thought was a great name despite the motel being a bit run down. 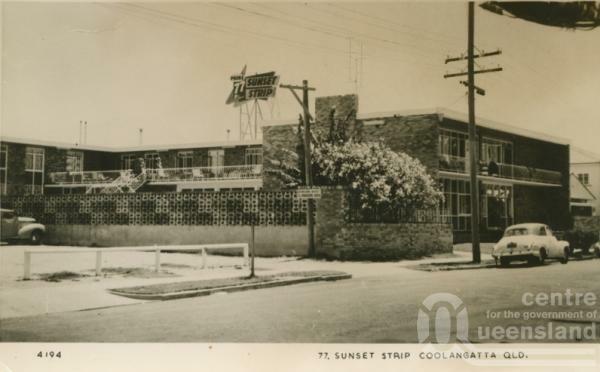 77 Sunset Strip Coolangatta, c1958. Postcard by Genuine Photograph, collection of Centre for the Government of Queensland. Rainbow Bay is a great location, apart from the beautiful walking track that winds around the south coast beaches for kilometres, it is within a short walk to the well-known Twin Towns RSL and the townships of Coolangatta and Tweed Heads. My mum and dad, sister and I stayed at 77 Sunset Strip motel in 1958, when I was 9 years old. I remember it as fantastic, although by todays (2014) standards it was a small motel. We went in July and the pool wasn’t heated. Dad and I ventured into the pool but I froze in pain. My dad tried to swim a few laps but couldn’t warm up and had to get out too. You could swim in the sea though. We had paid for all meals, breakfast, lunch and dinner. I remember the menu being extensive with multiple choices. Never had so many choices for breakfast. Of course it wasn’t the gourmet meals they put out today but I loved it. I remember talking to the chef in the kitchen and seeing a dishwasher for the first time. Camaraderie was encouraged between the guests and we had get togethers and a group photo taken. Best holiday I ever had. Thanks so much for your story. We stayed there around 1976 – we had a great holiday but I remember it was a bit run down when we were there. Still had a lot of fun.